Joseph Sumner (born November 23, 1976) is the son of actress Frances Tomelty and singer/actor/activist Gordon Sumner, known by the stage name Sting. He is the lead singer and bass player in the UK band Fiction Plane. 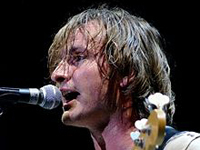 Sumner created a band with schoolmates Dan Brown (bass) and Olly Taylor (drums). Originally called “Santa’s Boyfriend”, the band played gigs in and around London and recorded two self-produced CDs: one self-titled and one entitled Swings and Roundabouts. After drummer Taylor left the band, the name was changed to Fiction Plane and they scored their first major label release, Everything Will Never Be OK (MCA Records, 2003). Joe Sumner attended The Cambridge School of Weston in Weston, MA, then Richmond University in London and graduated with a degree in environmental science. Now a three-piece, (Dan Brown left the band in late 2006), their second full-length album “Left Side of the Brain” was released May 22, 2007 on the indie label Bieler Brothers. The single “Two Sisters” has been the main hit from that album. The band will release a live DVD/CD titled Paradiso on March 23, 2009. Why does this writer nearly double over backwards to avoid mentioning Pete Wilhoit, Indiana boy and current drummer of Fiction Plane.